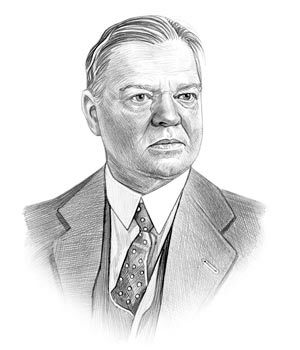 Herbert Hoover was the 31st President of the United States who served in office from March 4, 1929 to March 4, 1933. What was the life of Herbert Hoover like? The short biography of President Herbert Hoover covers important information and facts about his early life, his family, career and the famous events and achievements of his political life. Our short biography of Herbert Hoover provides an interesting and easy way to learn about the life of the President. The following important facts provide a fast overview of important facts about President Herbert Hoover. Facts and Info: Herbert Hoover was the 31st president of America who was blamed for the Great Stock Market Crash and the Great Depression in 1929. For additional info refer to 20 Facts about Herbert Hoover. Facts and Info: He was born on August 10, 1874 in West Branch, Iowa to a family of Quakers. His father was a blacksmith who died when Herbert was nine years old. His mother died three years later and the orphaned boy and his brother and sister were raised by their uncle Dr. John Minthorn, who lived in Oregon. Herbert Hoover died on October 20, 1964 in New York. Facts and Info: The career of Herbert Hoover included the roles of Engineer, Politician and Statesman. He received an excellent education and graduated from Stanford University. He became the 31st President of America in 1929 and served for 4 years until 1933. Facts and Info: Herbert Hoover married Lou Henry Hoover on February 10, 1899. The couple were in China during the Boxer Rebellion and lived in many other countries over a period of 17 years. Lou was extremely well educated and fluent in many languages. When the Hoovers wanted to speak privately they spoke in Chinese. They had 2 children whose names were Herbert Clark and Allan Henry. Facts and Info: Herbert Hoover belonged to the Republican Political Party. He was 54 years old when he was inaugurated as the 31st president. Inauguration is a President's swearing-in ceremony. Charles Curtis stood as the Vice President, he was the nation's first Native American Vice President. For additional facts refer to his Presidential Cabinet members. Short Biography of Herbert Hoover: What he was like! Facts and Info: Herbert Hoover was an imposing figure standing at 5 feet 11 inches, he had straight brown hair, hazel eyes, a ruddy complexion a round fleshy face. Hoover traveled the world as a mining engineer. He became a millionaire and owned silver mines. He followed Calvin Coolidge as the president who was known for the ‘Coolidge Prosperity’ but who left the nation unprepared for the economic collapse. Herbert Hoover was blamed for causing the Stock Market Crash and the Depression and lost even more popularity when he showed reluctance to help the millions of subsequently became unemployed. Facts and Info: During his lifetime he played a key role in important events of the era including the economic collapse of the country in 1929. Herbert Hoover was instrumental in passing the Hawley-Smoot Tariff that erected a wall of barriers against imports into the United States raising U.S. tariffs on over 20,000 imported goods to record levels. The Bonus Army March was a protest by World War I veterans and their families to demand payment of their promised bonuses. The heavy handed treatment of protest marchers by General Douglas MacArthur added to the unpopularity of the president. Facts and Info: He died of massive internal hemorrhaging on October 20, 1964 in his suite on the 31st floor of the Waldorf Towers New York. His body lay in state in the rotunda of the State Capitol. He was buried in West Branch, Iowa. The short biography of Herbert Hoover provides a fast overview of the key facts and events about his life and the accomplishments of his presidential term in office. The following Herbert Hoover video enables you to sit back and listen to the history of his personal and political life - a useful educational resource for kids, children and schools learning about the life of President Herbert Hoover.